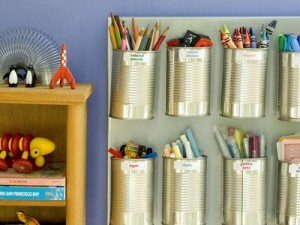 How to Organize Your Home – And Keep it That Way! Folks who work often wonder exactly what stay-at-home parents do. Since they get the cleaning and house work done after work hours, how in the world can it fill up an entire day for people who don’t also hold a full-time job? Parents (especially those who keep small children) unanimously agree that housework is a never-ending plethora of small and large tasks. Prepare breakfast. Feed children. Wipe floor, high chairs, and table. Wash those dishes and wipe counters. Change dirty diapers an hour later. Play with toys, clean up toys, clean up spilled water cup. Change wet clothes. Repeat for lunch and dinner. Add grocery shopping, doctor appointments, laundry, house projects, until well after 8 at night. The good news is that it’s possible to get all of the “stuff” done in a timely matter without doing it all day and without having a junky home. Ignore sneers of fellow moms with disgusting houses who forgo cleaning to “focus solely on their family”. Having a clean environment is part of serving the family! Getting and keeping an organized home takes more focus than stay-at-home parents are accustomed to, but we need to take some cues from the wage-earning workforce if we’re going to get it done. 1. Take responsibility for your junky home. Accept your problem and resolve to make some changes. Maybe you have a stressful part-time job. Maybe your husband is a packrat. Maybe you have eight children. The list goes on for reasons why your house is a pigsty and you often find yourself in emergency-clean mode before company comes over. Don’t buy into the fact that other priorities are far more important, or that organization isn’t that big of a deal. No, it shouldn’t be the sole thrust of life, but it plays a huge part in the emotional and mental health of your family. And you’ll save twenty minutes each day by not hunting for your keys or phone. You can’t take it with you when you die, and we’ll all get there sooner rather than later. Living as sparingly as possible will help you utilize what you own and reduce mental energy devoted to unnecessary clutter. Pick one room per week to pare down. Divide into garage sale and donation piles. Price everything as make garage sale piles to get a head-start. As you label each item with a price load it in boxes or on shelves in the garage. Keep each type of item (clothes, books, miscellaneous) in separate boxes. If you haven’t used something in two years, ditch it. No exceptions. By the end of this daunting task, which may take a month or more, you’ll have plenty of room for the things you need and use. If you need help, check out the 100 Things Challenge for inspiration. 3. Make lists of your home tasks. This brilliant idea comes from the Sidetracked Home Executives, two women who found themselves living in constant cleaning mode, without any clear direction, and figured a way to fix it. Create a master list of everything that needs to be done in each area of the house…and I mean everything. From sweeping and counter wiping to grout scouring and filter changing. Even special projects like painting, book organizing, or service events. Especially include things that keep you up at 2 a.m. nagging to be done the next day. Next to each item write how frequently you do the task and who is responsible for completing it. 4. Create daily task cards using your lists. Write all tasks that need to be done daily on one card and copy that card seven times. Then write out twice weekly, once a week, twice monthly, monthly (and so on) tasks on other note cards. I prefer to organize each color by frequency so I can quickly spot and sort tasks. If you need to, add more tasks like doctor’s appointments, errands, grocery list making, play dates, hosted dinners and others to cards as well. Some of us even need “Go to the bathroom cards”. Include it if you need to. 5. Sort task cards at the beginning of each week. Take a night at the beginning of the week (Sunday works for me) to “sort out” the week. For less frequent tasks like weeding or garage cleaning, I write in pencil on the card when the task was done so I can remember when sorting comes around. Try to keep each week basically the same to maximize your efficiency (think assembly line). If you have small children at home, this will help them mentally prepare for each day and ease some of the uneasiness associated with sidetracked guidance. Today is what I’d call a moderate cleaning day. Monday is a tough cleaning day. Sunday and Thursday I stick to daily cleaning tasks and that’s it for housework. Keeping to-dos sorted and straight as well as designating certain dates for heavier work than others allows more time to engage with kids and host friends and neighbors at home. You won’t be able to think of absolutely everything at the beginning of this process. You’ll add many more cards as you go! Not that this process should make you feel more bogged down, but rather writing it down and filing it appropriately helps you surrender the mental energy required to keep reminding you to do that project you keep forgetting about. Write it down and file it. And you’ll need to reorganize throughout some weeks–this isn’t a science and you don’t need to be perfect! 7. Enlist your family to participate. A brilliant side effect to this system comes when you’re out of commission. If the flu strikes or you’re struck with prego all-day nausea, someone else (hubby, mother-in-law, sweet neighbor) can easily follow through with your lists. Add special notes to each card if you’re relying on that help (Mop Floor 30 minutes: Pine Sol under kitchen sink and mop in pantry). Delegate as much as you can to your family as well. Even toddlers can put dirty clothes in the hamper and organize toys. 8. Keep the junk under control. As you progress with this organization, it’s crucial that every item in your house have a comfortable place. It’s fine to tightly pack certain items (seasonal decorations, off-season clothes) but things used daily or weekly need easy access. Everything deserves a place. If you can’t engineer a space to house it, ditch it or something else taking up space. The vast majority of our planet’s population lives in a one-room hunt smaller than the average storage space. Keep it in perspective. 9. Stick with the plan for at least 3 weeks. You’ll be tempted to do laundry a day early, just because you finished other tasks faster than expected or you have extra energy. Let’s get ahead, right? Refrain! Stick to your plan rigidly to establish an efficient, predictable routine. The more you do out of order, the more you’ll do in general. Any type of work can occupy as many as 24-hours if we let it become an obsession. Finish your cards and stop for the day. Does following this regimen mean your house will be spotless every moment of every day? Let’s hope not! While maintaining the organization and cleanliness of your house is important, it doesn’t take precedence in your life. Staying focused will help you maximize your allotted cleaning time so you don’t go overboard. Ashley G is an organizing machine! She writes about her adventures in lifestyle design, organization, simplification and frugal living on the Gift Card Granny blog, where she even teaches people how to organize their gift cards. 3 Responses to How to Organize Your Home – And Keep it That Way! I’m a slob, but I’m also a list maker. So I think this strategy might actually work for my home. Thanks!